HÀ NỘI — Việt Nam welcomed more than 5.54 million foreign visitors in the first four months of 2018, a year-on-year rise of 29.5 per cent, according to the General Statistics Office. The number of tourist arrivals from Asian countries increased by 36 per cent from the same period last year. Most of the major markets reported growth, including the Republic of Korea (up 67.3 per cent), China (39.7 per cent), Malaysia (16.3 per cent), Taiwan (14.3 per cent), Thailand (9.2 per cent), Singapore (8 per cent) and Japan (7 per cent). The number of European visitors rose by 12.9 per cent, with strong growth seen in Italy (19.7 per cent), Russia (13.4 per cent), the UK (11.1 per cent), France (8.6 per cent) and Germany (8 per cent). Việt Nam also saw an increase in the number of holidaymakers from Africa (22.5 per cent), the Americas (13.4 per cent) and Oceania (12.6 per cent). 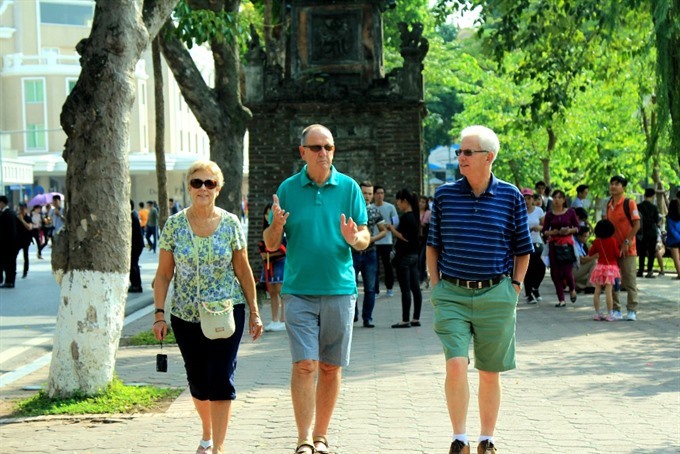 In April alone, Việt Nam greeted over 1.34 million international vacationers, up 25.2 per cent compared to the same period last year, due to a crowded calendar of special activities. They included the Việt Nam International Travel Mart and Việt Nam’s Ethnic Culture Day in Hà Nội, the tourism festival in HCM City, the Mon Asian Food Festival in Hà Nội and Quảng Ninh Province and the opening ceremony of the National Tourism Year 2018 in Quảng Ninh. Việt Nam welcomed a record 12.9 million foreign visitors in 2017, a year-on-year increase of 29.1 per cent. The country aims to serve more than 15.5 million foreigners in 2018. Popular travel site Rough Guides ranked Việt Nam among the 20 most beautiful countries in the world in 2017. The site sings the praises of the astonishing rock formations in the UNESCO world heritage site Hạ Long Bay and the endless beauty of terraced rice fields in the mystical mountain town of Sa Pa.